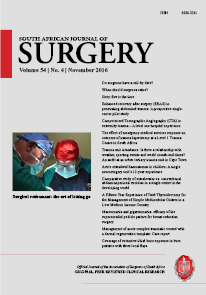 Introduction: Total thyroidectomy as a treatment for simple multinodular goitre is not well recognised in most centres in low middle income countries. Methods: This paper is a retrospective review of outcomes of total thyroidectomy for simple multinodular goitres in the last fifteen years in a tertiary hospital in Nigeria. Results: A total of 652 thyroidectomies were done from January 2001 to December 2015. Simple multinodular goitres were indication for a total thyroidectomy in 447 patients (68.6%) with a male to female ratio of 1:6. Postoperative complications were hypocalcaemia in 22 (4.9%), unilateral recurrent laryngeal nerve palsy in 13 (2.8%) and haemorrhage in 2 patients. Others were seroma and cellulitis. Tracheostomy was required in 35 (5.8%) patients but none was permanent. Conclusion: Total thyroidectomy is a relatively safe treatment option for patients who have simple multinodular goitre. It provides a permanent cure with a low postoperative morbidity risk. The burden of replacement l-thyroxine needs to be discussed with the patients.